Insurgencies are like hydras. Once an insurgency begins, the measures a government takes to eliminate militants can provoke countless others to join the enemy ranks. Tactical victories often breed strategic defeats. Unfortunately, due to sales rights restrictions, we cannot offer Hearts, Minds and Hydras for sale in your country. Insurgencies are like hydras. Once an insurgency begins, the measures a government takes to eliminate militants can provoke countless others to join the enemy ranks. Tactical victories often breed strategic defeats. Traditional “search, destroy, and withdraw” missions that rely on firepower to wipe out rebels frequently destroy the livelihoods and loved ones of innocent people caught in the cross fire. U.S. troops have seen the pattern repeated as their initially successful offensives toppled enemy regimes in Afghanistan and Iraq but soon transformed into grueling guerrilla wars. 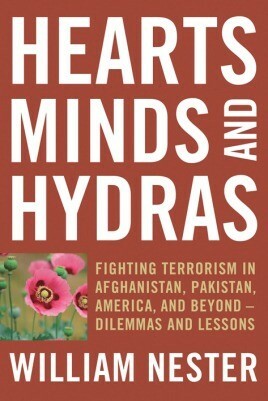 Hearts, Minds, and Hydras outlines the reasons for these worsening situations. The most crucial were self-defeating decisions made by the George W. Bush administration, whose neoconservatism and hubris rather than a careful analysis of genuine threats, American interests, and reasonable options shaped its policies. Although the Americans were eventually able to contain and diminish the insurgency in Iraq, the one in Afghanistan not only steadily intensified but also spread into neighboring Pakistan. The near abandonment of the war in Afghanistan and the neoconservative campaign in Iraq were godsends for al Qaeda and all other enemies of the United States. Then, as America’s position deteriorated in both wars, the neoconservatives became even more determined to stay the course. William Nester analyses some of the more prominent dilemmas haunting American policymakers now struggling to win in Afghanistan, fight terrorism in the United States, and reshape their relationship with Pakistan. In doing so, he reveals the nature of that all-too-real beast of insurgency and terrorism, the hydra; what feeds it; and how to starve it.